Hello guys, I just bought an English Morris Mini Moke. I'm in the Classic Mini Club in Peru (I have other 3 conventional Minis). I'm writing the story of the Moke, it's very cool how she arrived to the middle of the andes (in a little town that was found by the Incas). The Commission Number is 15B - 000865 L. The VIN is M - AB1L - 674363. And the Body Number is AMB 000866 N. I'm very excited! I will be so happy if some of you can help me with tips for the restoration. Thank you all by advance. Welcome to the forum It certainly looks like you've got a good start there, better than some you see for sale over here!! Get a copy of Roy Scott's book 'A Comprehensive Guide To Restoration'. 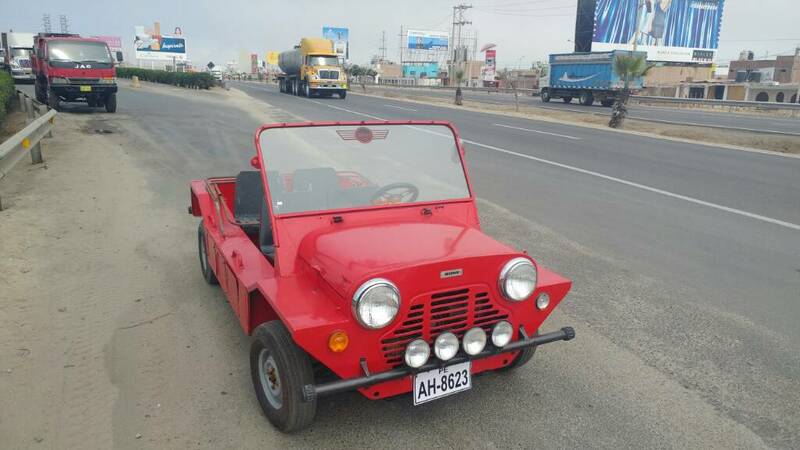 Enjoy your Mini Moke - looks like it is a runner. Are those the original metal seats". PS I note that your Moke does not have windshield wipers, canopy (easy fix, you have the supports).